Sunday the 9th of October saw the 6th and final event in the Scottish MBO summer series. This was our second attempt at organising an event and we were keen to make good on all the learning opportunities our last event had offered us. 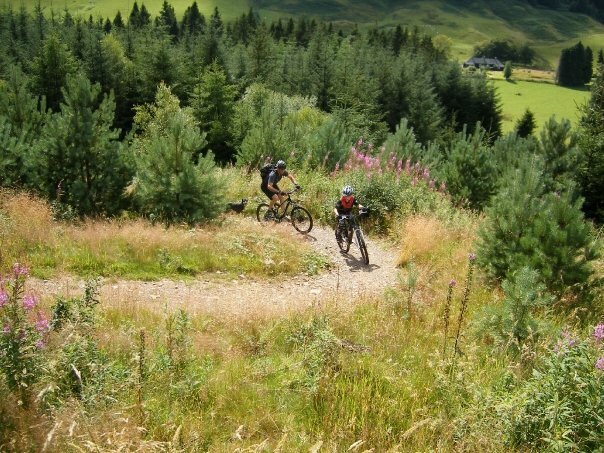 The venue we chose for this finale was Ae forest in Dumfriesshire, a 7stanes centre and home to some rugged single track and a café serving some excellent cake. We were keen to use Ae as, in common with our last event, it offered the chance to set a course that incorporated hardly any tarmac as well giving competitors a chance to ride plenty of grin-inducing single track. The 40km2 area we had decided to use is mostly forestry and surprisingly hilly with some lung busting climbs. The run up to the event saw us making several trips over to Ae to check out the area and the accuracy of the OS map – it’s amazing how whole forest roads can completely disappear given a few years without any use. Having spent many hours in the saddle and even more working on the map we were finally ready. This year the SMBO events have been blessed with outstanding weather however our run of good luck on the sun stakes couldn’t last and true to Scottish form the days prior to the event were rather soggy. Given the grey conditions nearly 40 hardy souls donned their wet weather gear and headed to the start line. It was great to see new faces making an appearance as well as the regular SMBO hands. One pair came home early with a broken rear mech but rather than admitting defeat they simply hired another bike from the shop and set off again as they were “having too much fun to stop early” (always good to hear!). As the 3 hours drew to a close, tired, muddy, smiling faces started appearing over the horizon. The bike wash and showers were soon put into action. Congratulations to Jackie Jamieson and Margaret MacIntosh who, on their first attempt, won the female team with 180 points, Katie and Robin Munro who won the generation team with 320 points, Keith and Lynne Brydon who won the mixed team with 340 points, James Daplyn and Paul Ryan who won the male team with 350 points, Alison Gillies who won the female solo’s with 300 points and Alan Hartley who won the male solo’s with 390 points. Thanks go to Andy McLennan for all his help and support, everyone who helped collect in check points after the event and to the staff at Ae who couldn’t have been more helpful. Thanks also to our sponsors Alpine Bikes and High5 from providing prizes and emergency rations. So that’s the end of the summer series and I’m already excited about next year! First visit to Ae,well worth the trip frae Newcastle,despite the weather. Some brilliant riding both on and off the 7 stanes trails.Well done to Walt and co for putting on this event,hope to return in 2012.Cheers for noo, Steve.